Imagine the overwhelming feeling of relief and sheer joy that you would feel upon the release of a kidnap victim. Now imagine the subsequent stress that would follow the realization that you are not insured in case of a kidnapping or ransom request. Your company or family had to liquidate ALL assets to pay the large ransom, purchase specialized phone equipment, pay for travel expenses, hire security protection, hire a negotiator, and pay many more unforeseen costs. In addition, to rejoin society, the kidnap victim may need extensive psychiatric counseling and rehabilitation. This financial trouble could be avoided with Kidnap and Ransom Insurance coverage. 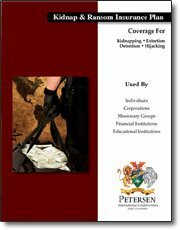 Petersen International Underwriters has developed Kidnap and Ransom Insurance to reimburse the policy owner for the expenses incurred in the event of a kidnapping. The International Engineering Firm. The company won a bid for a design and building project in Iraq. This was great news for the firm, but not such great news for the HR and Risk Management Departments. They had to scramble to find replacement Group Life, LTD, AD&D, Medical, and Kidnap & Ransom Insurance coverage for the employees being deployed, and of course the concern of war and terrorism was very important. They came to Petersen International Underwriters, the firm that has been writing war risks for over 30 years. A Kidnap and Ransom Insurance policy owner can apply for coverage to protect against a financial loss caused by a kidnapping or extortion—coverage up to their personal or corporate net worth. If a claim is made, the Kidnap Insurance policy owner will be responsible for coming up with the initial money to provide the kidnappers. After the money has been paid, they can then submit a claim to be reimbursed for the expenses. We even provide Ransom Insurance to cover lost ransom money, should the delivery go wrong. One of the most beneficial parts of the Kidnap and Ransom Insurance plan is the unlimited expenses for the Crisis Response Team. This Team has worldwide knowledge about negotiations in each specific location and is highly trained to deal with kidnappings, ransom requests, and extortion plots. No one expects to have to recover—emotionally or financially—from the trauma of a kidnapping of a colleague or loved one. But should the situation arise, you will be relieved to know Petersen International Underwriters has you covered with Kidnap and Ransom Insurance.